This 2018 Limited Edition is the meeting of two icons and strong symbols of the Made in France ideal: our Pop Up XL on the one hand, and on the other, the timeless Breton striped shirt, the fashion classic. 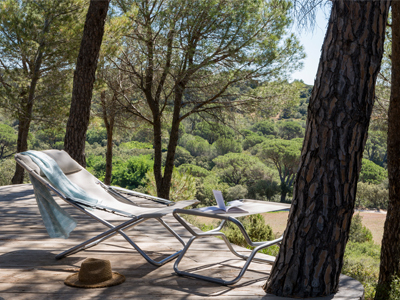 It is also the opportunity to highlight our French garden furniture manufacturing! 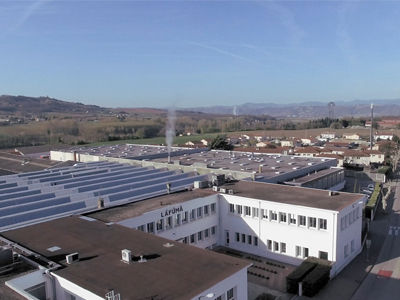 You will definitely recognize the Pop Up, an iconic product since the 90s, but you will probably not realize all of the manufacturing steps that go into creating it… In this article, we take you behind the scenes in manufacturing at our historic factory located in Anneyron (Drôme)! It all starts in the design studio with Corrado and Martine, who design and create all of the products such as our essential relax armchair and our loungers. It is here that the first prototype of the Pop Up started out. After finalising the design, the industrialisation phase is next, then production. Everything starts with the arrival of bundles of aluminium tubes, of 4 different lengths. The tubes are shaped to create the frame of the Pop Up. Then it is off to the paint shop where the series of 50 parts follow one after the other! We join Cédric and David who hook the raw material parts onto slings - made to measure for each of our designs!! - hanging from a conveyor, just like on a ski lift. Let’s go, all aboard for the paint shop, firstly going through the TTS (Surface Treatment Tunnel), which cleans the frames and adds an anti-corrosion product. 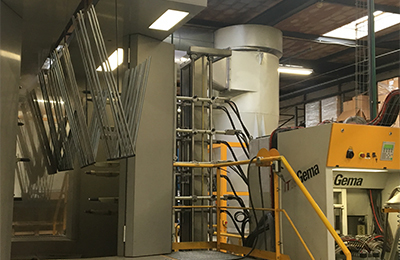 The paint shop, managed by Sarin and Alexandre, functions as a closed circuit in order to use a minimum of materials, with continuous recycling. The procedure used is powder sprayed by guns. The powder, which comes from a supplier in the Haute Loire area, gives excellent resistance to UV rays and allows us to guarantee the products for longer. It is fixed with an electrostatic charge and must be then baked at 235°C to make it solid on the tubing. For that, it is off to the oven... which is 30m in length! Where does the fabric come from? 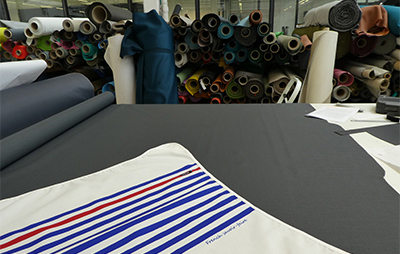 After being woven in the Vosges by a family business, which is nearly one hundred years old, it continues its journey down the Rhône, to Tarare, where it is dyed white then printed with its striped design and its signature “ French Savoir-Faire ”. After pattern cutting, the red hems and flap edging are sewn. The fabric made in this way is rolled around the the frame there you are: the Pop Up is packaged, labelled and ready to be shipped to you! The Lafuma Mobilier Limited Editions are always popular! Since 2006, around 30 types of Pop Up have been designed, following the current trends or as a collaboration with partners who share the same values as the brand. 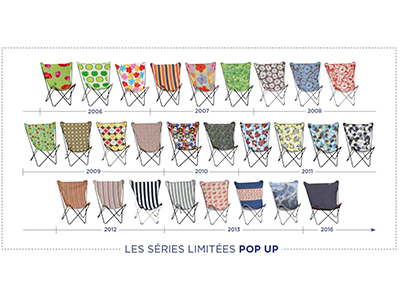 The last one previously made was the Pop Up 26, the result of a collaboration with 1083, a Drôme-based manufacturer of jeans, woven, dyed and manufactured within France, which, like Lafuma Mobilier, hold the title Origine France Garantie). The Limited Edition Breton stripe has all of the advantages of the Pop Up XL, in particular, lightness, compact footprint and practicality. The big brother of the Pop Up, it is as design-worthy and even more comfortable with its wider fabric, which offers a more generous seating position. Chic and timeless, it works perfectly with types of interior design as a true decorative piece. Also, the re-designed hinges giving it a more contemporary look, and the ease of folding let you use it in a thousand and one ways! 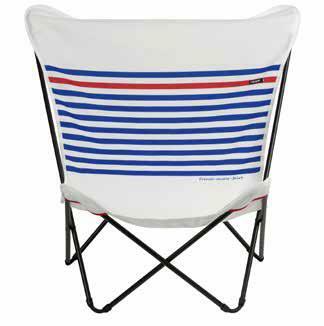 DIscover our new Pop Up XL Marinière !